SY "HEAVEN CAN WAIT" NISSEN 72 Classic Cutter Rigged Sloop was modeled on the classic J-Class yachts, in particular "Endeavor". However, in manageable size. In contrast to the original, the underwater vessel and the attachments were built on the basis of current regatta yacht models and the ship was designed as a lightweight performance cruiser. Due to its deck layout and the equipment of the machine, the boat is well suited and easy to handle with a small experienced crew. It has been sailing for many years by the first owner and his wife in pairs and also maneuvered well in narrow ports. Originally designed for commercial chartering with crew, the yacht was built according to com- mercial standards and operated with the ship safety certificate of SeeBG. It was constantly main- tained at the highest level. At the moment, the ship is located in northern Germany, but has suc- cessfully sailed in the Mediterranean, the US East Coast and the Caribbean for many years and is also suitable for long ocean trips in developed areas. The ship still fascinates after 17 years by its incomparable look. The sailing magazine "Yacht" stated in an article "Germany's most beautiful yacht"; at the ARC "Heaven can wait" won the special prize for the "Most Beautiful Yacht" in addition to the actual prizes in the respective groups. 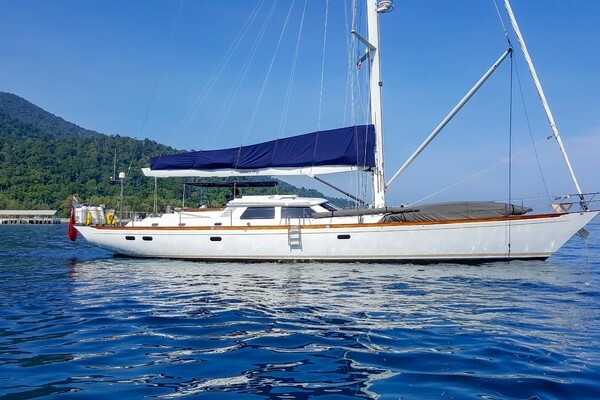 United Yacht Sales New Jersey would love to guide you through a personal showing of this 72' Nissen 72 - Cutter Rigged Sloop 2001. This yacht for sale is located in Flensburg Germany and priced at $1,200,000. For a showing please contact us by filling out the form on this page and we will get back to you shortly! Refrigerator: Yes Deep freezer: Yes Micro wave oven: Oven FORCE 10 with proper gas installation. BOSCH electric oven, grill and microwave Stove: 4 burner gas stove. Air conditioning: Air conditiong in master and guest cabins Hot water in all cabins Water maker: SEA RECOVERY aprox. 160-170 l/h.